There has been a lot of interest in the media about the ill effects of sugar consumption. Intuitively, most of us know that eating a diet high in sugar can contribute to ill heath effects. According to the USDA, over the last 30 years Americans have increased their sugar consumption by 20 pounds per year per person to 100 pounds. In the same amount of time, there has been a significant increase in chronic diseases such as obesity, diabetes, cardiovascular disease, and cancer. We are eating too much. More specifically, we are eating too much sugar. The ‘low fat’ movement prompted food products once filled with fat to be manipulated and then re-filled with sugar. Packaged food products have some amount of added sugar; it is everywhere we turn, making it difficult to avoid and keeps us in the sugar addiction loop. Glucose: a simple sugar that fuels every cell in our body. Extra glucose is stored in the liver and muscles as glycogen. Fructose: a simple sugar that is found in fruits and vegetables. it is not inherently a problem, but becomes one when there is long term over consumption. Sucrose or table sugar. It is 50% glucose and 50% fructose. High fructose corn syrup: It is a 55:45 mix of glucose and fructose. It is highly processed and contains a bond that our body can’t break down. It is is sweeter than sucrose and highly subsidized. There are sugar alcohols which are increasing popular and are neither sugar no alcohols: xylitol, glycerol, sorbitol, maltitol, mannitol, and erythritol. They are not completely absorbed in your small intestines, have fewer calories but for some may cause digestive distress (bloating, diarrhea, flatulence). Sucralose (Splenda) is NOT a sugar, It is a chlorinated artificial sweetener along the same lines as aspartame and saccharin, with similar detrimental health effects. Agave syrup: Touted as a healthy sugar having a low glycemic index (doesn’t spike blood sugar), it is typically HIGHLY processed and is up to 80 percent fructose. The end product is very different than the original agave plant. Maple syrup: when minimally processed, primarily contains sucrose and water. It has several nutrients in it not found in table sugar. This is not that same as ‘maple syrup flavored syrups, which should be avoided. Honey: is about 53% fructose. It is completely natural in its raw form and has many health benefits when used in moderation. Stevia: is a sweet herb derived from the leaf of the South American stevia plant, which is completely safe (in its natural form). It has next to no calories, doesn’t spike blood sugar nor have detrimental health effects. It comes in green powder, white powder and liquid. The green powder is the most natural, as it is just the stevia leaf ground up. While sucrose, or table sugar, used to be what was used to a large extent to sweeten products, there has been a trend towards fructose. Many feel that it is the fructose in excess that is to be blamed for the growing number of metabolic problems that people suffer from. Most are aware of the perils of high fructose corn syrup (HFCS) a cheap, manipulated sugar that taxes our body and has a higher content of fructose than sucrose. It is used as a sweetener in many many foods, which we suspect may be promoting more consumption and leading to more fat production. You may be thinking, ‘fructose is naturally found in fruit, fruit is healthy’ -this is correct. Keep in mind that the packaging is important. The effects of eating an apple is really different than drinking a glass of apple juice. A piece of fruit contains vitamins, minerals, phyto-nutrients and fiber that tempers the effects of the fructose. Juice (sweetened with HFCS or not) can have a negative effect due to its larger fructose content. While one can argue that juice has nutrients in it that say, a can of soda doesn’t, when it comes to fructose content they can be virtually the same. It is mostly metabolized in the liver, which, in excess gets stored as fat. In part, this can contribute to (non alcoholic) fatty liver, increases in abdominal fat, elevation in triglycerides, elevation in uric acid, promoting high blood pressure, contributes to insulin resistance, metabolic syndrome and type II diabetes. It interferes with hormone signaling (insulin, leptin and ghrelin) making it difficult to know when you are full, actually tricking you into thinking that you are still hungry. This leads to more calorie consumption. 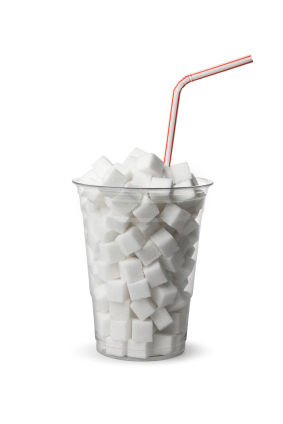 Most people need to reduce the overall consumption of sugars, regardless of the source. It is doesn’t matter if it is organic sugar bought from the Natural Food Store. It is all about what happens when the sugar hits your blood stream. The answer, as we know, to return to a more natural diet, meaning a diet of whole organic foods, cooked from scratch, without added sugars and other chemicals. To figure out how many teaspoons of sugar are in something, divide the sugar content by 4. For example if the label says it has 24 grams of sugar, that’s 6 teaspoons, or about 96 calories from sugar. Avoid sugared beverages. This is huge source of excess sugars. Sports drinks, soda, energy drinks, fruit juice. If you do drink juice, limit it to 4-6 oz at a time. For those of you who like to juice at home, I was recommend juicers that use the whole fruit separating the pulp (fiber) out. Rely on whole foods to satisfy your sweet tooth: example: Sweeten your muffins with dates or bananas. Consider natural raw honey, stevia, xylitol, (real) maple syrup, as sweeteners in small amounts. For those of you interested, there are some great documentaries out there speaking to the over consumption of sugar (amongst other things) and the motivations behind it.